Open Season: Brown trout, Salmon and sea trout – March 17th to September 30th. Angling controlled by the Cahir Angling Club starts from a point 200 m downstream of Cahir town to Garnavilla Ford. It is an excellent trout fishery. The river is broad at this point with a brisk flow and has an average depth of approximately one metre. The banks are quite safe and offer no hindrance, with access to the river for the purpose of wading being achieved quite easily. Great quantities of rocks are placed around the river bed and they provide some very good cover for the trout. There is an excellent population of trout along this stretch some of which are up to 30 cm and more. The fishery extends from above the Swiss Cottage to Carrigataha on the right bank, and Garnaville on the left bank, and all anglers are restricted to fly only. contain stocks of trout of up to 30 cm. Downstream to Ardfinnan, a deeper channel exists and contains moderate stocks of trout. The right bank is not particularly user friendly so caution must be exercised. During the summer evenings, this stretch is best fished using sedges, for trout which frequently exceed 30 cm. Within that stretch 1km up-stream of Ardfinnan Village, Suir Valley Fisheries control the fishing on the left bank. excellent stocks of trout up to 30 cm. 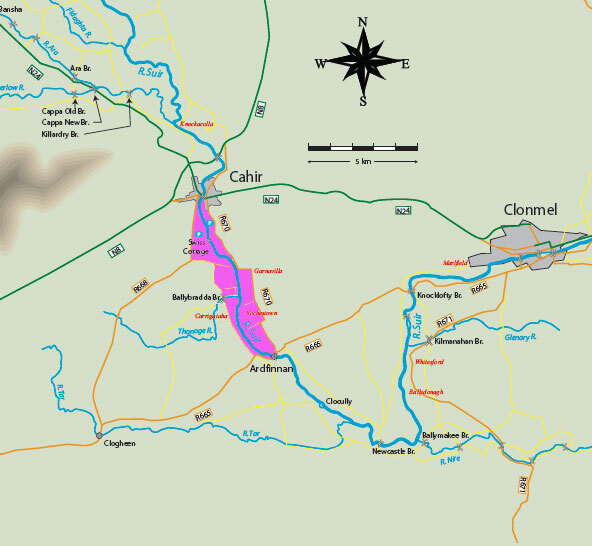 Note: This map is an old one and doesn’t include the M8 Cork – Dublin Motorway that now runs from Cashel, through Cahir and on to Mitchelstown.